Who Gets Tased? First Statewide Study Reveals Racial Disparities Connecticut is the first state requiring police fill out a form when they use a stun gun. Research shows police used stun guns on black and Latino suspects at a higher rate than on white suspects. 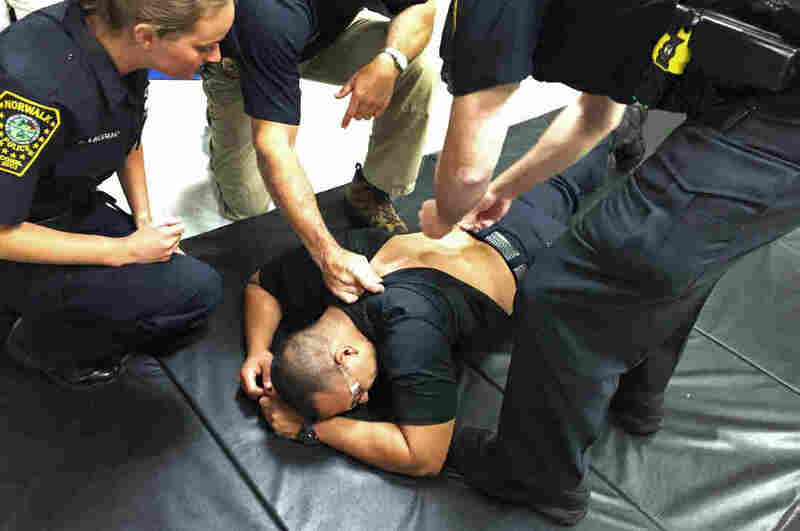 Police trainers place bandages on Officer Edgar Gonzalez's back after removing Taser prongs. He was Tased as part of his training at Norwalk Police Department's headquarters in Norwalk, Conn.
How many times last year did police pull a Taser on suspects nationwide? Just like the total number of people shot by police, no one knows for sure. Connecticut is the first state to require police to fill out a form for every time they pull a Taser. And it just released the first-ever statewide report on how police use them. Police use stun guns against suspects who show what cops consider threatening and resistant behavior. The shock can get them to follow orders, and according to police, Tasers can level the playing field. "You're not depending just on size and strength in order to arrest someone," says Norwalk Police Chief Thomas Kulhawik. "Even a small-statured officer against a larger individual can still have a Taser as a tool to use to gain compliance." 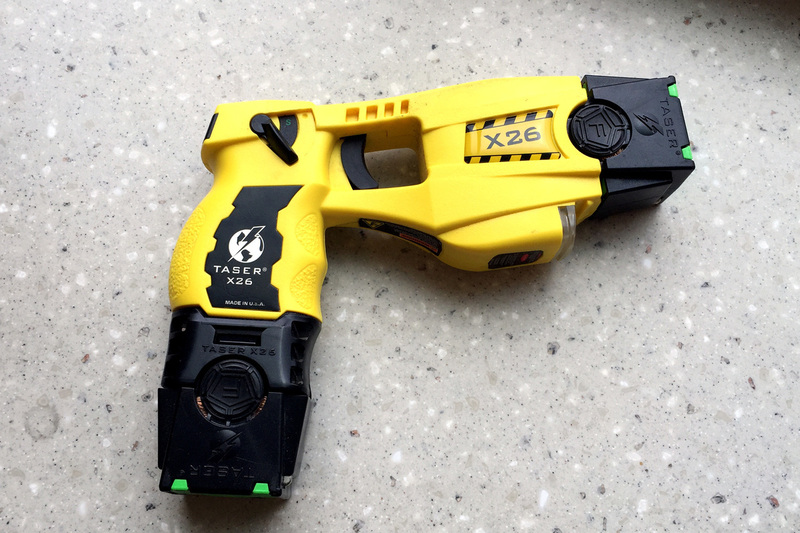 Most law enforcement agencies in Connecticut use weapons produced by Taser International, one of the main manufacturers of stun guns. Kulhawik says Tasers are effective tools because neither the officer nor the suspect is usually injured. But he admits Tasers can be abused, and in extreme cases can result in death. A stun gun used by officers with the Hartford Police Department. In some Connecticut police departments, before officers can start zapping suspects they have to get Tased themselves. "I know it's five seconds long," says Officer Edgar Gonzalez, his fists clenched. "It's probably going to feel like the longest five seconds ever, but let's do it." The new recruit is standing in front of a padded mat inside the Norwalk Police Department. His back faces one of his trainers, who is armed with a Taser. The Taser fires, and Gonzalez groans, dropping to the mat. Seconds later, Gonzalez says he feels drained — but no pain. "I think it's going to be a great tool," Gonzalez says. "I know that after going through that, I'm glad I will have one on me." According to the new report, Connecticut's police used Tasers 650 times last year. Ken Barone, a researcher at Central Connecticut State University's Institute for Municipal and Regional Policy, co-wrote the report and found racial disparities in the data. He found that black men were about three times more likely to be Tased than simply warned. For Latino men, it was over 40 percent more likely to be Tased than warned. For white men, the chance of being Tased or warned were about the same. "Some of this might be driven by the fact that those departments that submitted the most Taser reports are larger, more diverse cities," Barone says. Barone says researchers need more time to figure out what's driving those racial disparities. And there was another trend that stood out. "Nearly one-third of all Taser incidents involved a person that the officer believed to be emotionally disturbed," Barone says. Taser International warns against using its stun guns on people experiencing psychiatric crisis or on children. Thursday's report found that nine of those Tased last year were younger than 18 years old — seven of whom were black and two white. Police reported five of them as "emotionally disturbed" or "suicidal." All the report's information came from the forms cops are required by state law to fill out every time they pull a Taser. But there were cases of under-reporting. For example, the Hartford Police Department did not report the case of Matthew Russo, a 26-year-old man who died after he was Tasered last April — until researchers followed up. Deputy Chief Brian Foley says Hartford Police is trying to improve their reporting system for Tasers. "The infrastructure's not there. There's no way to track it," Foley says. "And that's our goal, is to get it back and have it on camera, be it on Taser camera or on body camera, any time it's used." Wilson Ramos got a tattoo of his brother's name, Jose "Cheo" Maldonado, inked on his right forearm in memory of Maldonado, who died after a police officer shot him with a stun gun inside a jail cell in East Hartford, Conn.
Video recording of police using Tasers may be a ways off for many departments. In the meantime, Wilson Ramos says that goal and this new report gives him some hope. 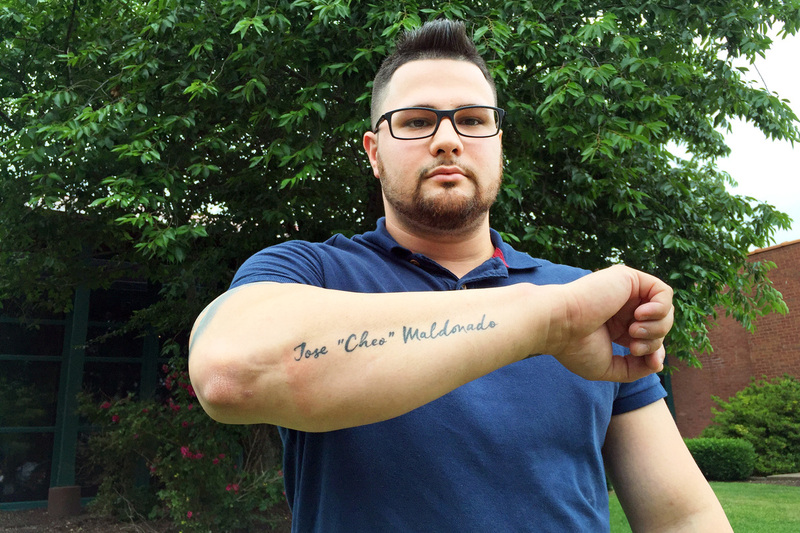 His brother, Jose Maldonado, died two years ago in a jail cell after police Tased him. "If this is a step forward so it can avoid someone else dying, then I'm glad it's in place," Ramos says. "But as far as for me, nothing's going to take back that moment. I'm not going to get my brother back." According to the East Hartford Police Department, Maldonado was combative after officers arrested him for punching a car window while intoxicated. Ramos has filed a federal lawsuit against the department. "Due to the mandatory reporting now, I think it's going to come to light that these things get used more often than they should for situations that don't warrant it," Ramos says. Even in Connecticut, researchers say they still don't know how often that actually is. And the rest of the country knows even less. "The collection of such data is just sporadic, haphazard," says Bob Kaminski, a professor at the University of South Carolina who studies how police use and keep track of Tasers. A federal court did recently rule that police in the Southeast can't Tase someone for simply being uncooperative. And California has passed a law requiring police to report Taser incidents and other uses of force that seriously injure or kill people. But there are no similar laws regarding Tasers in other states or at the federal level. "There is no national standard," Kaminski says. "Policies vary by agency. There are recommendations that are put out, but they can decide themselves regarding the policies." Researchers in Connecticut say they hope their state will serve as a model of tracking Tasers for the rest of the country. The audio of this story, as well as a previous Web version, should have noted that while most law enforcement agencies in Connecticut use weapons produced by Taser International, the company is not the only manufacturer of stun guns.